Frosting is an adorable cupcakery that the Crusaders visited during their most recent cupcake tour, this past fall. I happened to be down that way last Friday and decided to stop in and see if they had any “luv” inspired cupcakes. Boy, was I in luck! 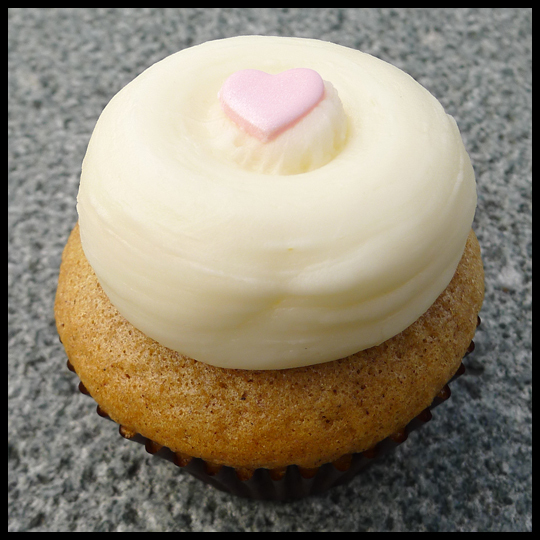 This cute and simple cupcake was their “Autumn Luv” cupcake, spice cake with their signature almond buttercream icing. 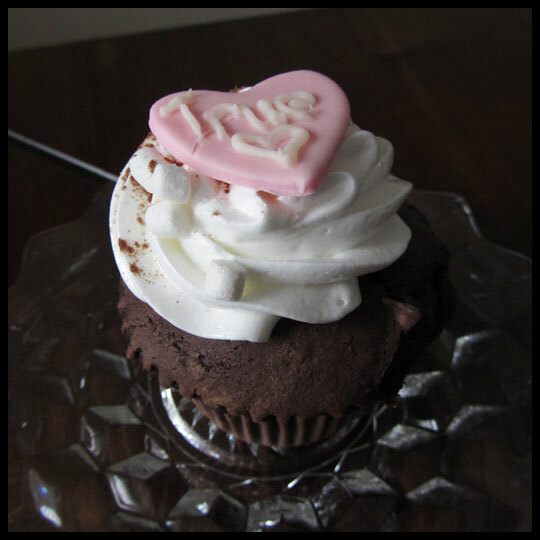 I was so excited that they had a Valentine’s Day decorated cupcake that I bought it (and a latte) right away! Sadly in my excitement, I forgot to ask Jenn or Stacy if they wanted any – we have a pretty strict “text/call and make sure we don’t want any cupcakes before leaving any cupcakeries empty-handed” rule – so when I got home, I carefully cut up this lovely cupcake and saved 1/4 for each of them. I know both Stacy and Jenn enjoyed their “bites” and I sure hope the next time I am down that way, Frosting has more “Autumn Luv” to spread around! How did you show your “luv” yesterday? And, Happy Valentine’s Day (one day late) everyone! Flowers, Hearts, Candy, and CUPCAKES! I’ll be honest. I love Valentine’s Day. Even in my single days, my family and friends always made me feel very loved on this day filled with cupids and hearts, so I was very excited to see all the Valentine’s Day specials being offered by local bakeries and cupcakeries. It had been a while (and by “while” I mean a whole month) since my last visit to Kupcakes & Co. so when I saw they would have some amazing Valentine’s Day cupcakes, I knew that was where I wanted to order my sweet treats. From cupcakes, to cake pops, to sugar cookies, they had it all! 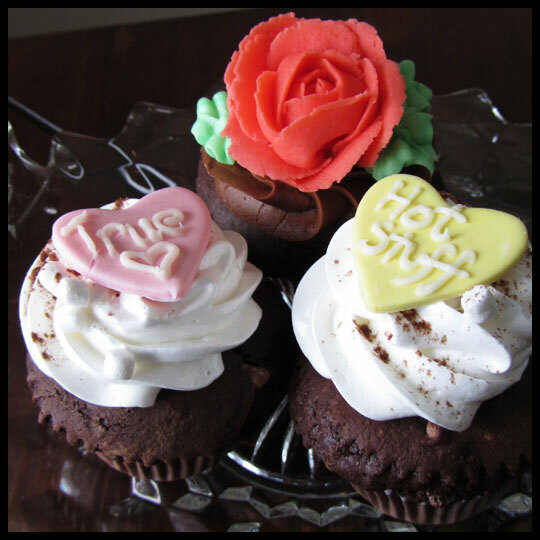 For their cupcakes, you could pre-order a dozen cupcakes with conversation hearts, a dozen cupcakes with roses, or the ULTIMATE CUPCAKE. Each conversation heart had a different message like, “True,” “Hot Stuff,” “Hottie” and “Text Me.” The flavor below is Hot Chocolate. It’s one of our favorites, which we reviewed here. Not knowing how much longer they will carry this seasonal flavor, we knew it was a must have. Next, was the Chocolate Chocolate topped off with a edible red rose. 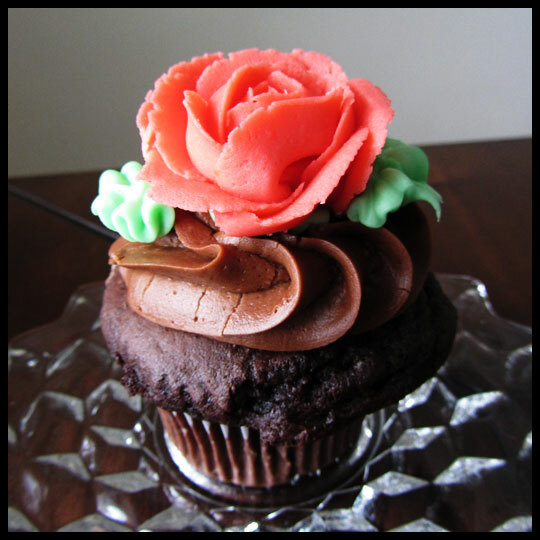 The roses were beautiful and completed the look of this cupcake perfectly. 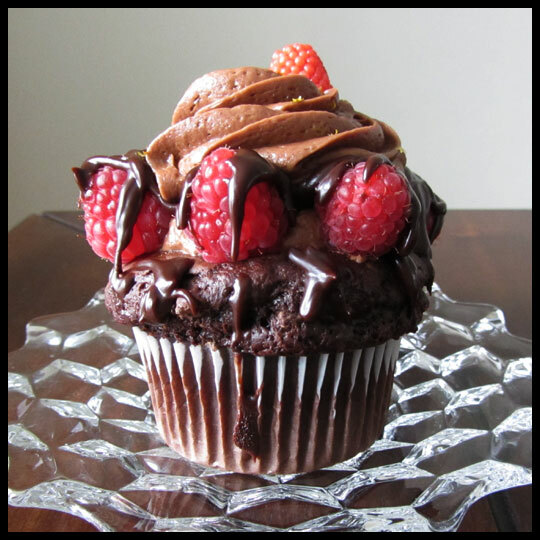 As I mentioned above, Kupcakes and Co. offered the ULTIMATE CUPCAKE (for pre-order only), which is an oversized chocolate or red velvet cake that has been hollowed out and filled with rich chocolate mouse and fresh raspberries. Then, when you thought it couldn’t get better, it’s topped with a smooth dark chocolate ganache, creamy chocolate buttercream or cream cheese frosting, and edible gold flakes. The one pictured above is a miniature version of the real thing. You can see the full size version on their Facebook page. Our friends at Kupcakes & Co. were sweet enough to treat the Crusaders to this special gift. It definitely is the ULTIMATE CUPCAKE. I can’t imagine how impressive the full-size one must be becuase this smaller version was still plenty to share between two people and it blew me away. The fresh raspberries combined with the rich chocolate is the perfect way to indulge with the one you love, whether it be a best friend, sister, or significant other. It might be too late to order these cupcakes from Kupcakes & Co., but make sure to treat yourself to something sweet this Valentine’s Day!